Abstract: The Komjatice depression, situated on the Danube Basin’s northern margin, represents a sub-basin of the Neogene epicontinental Central Paratethys Sea and Lake Pannon. The paper provides an insight into the character of sediment provenance evolution by study of well cores (ZM-1, IV-1, MOJ-1, VR-1 wells). 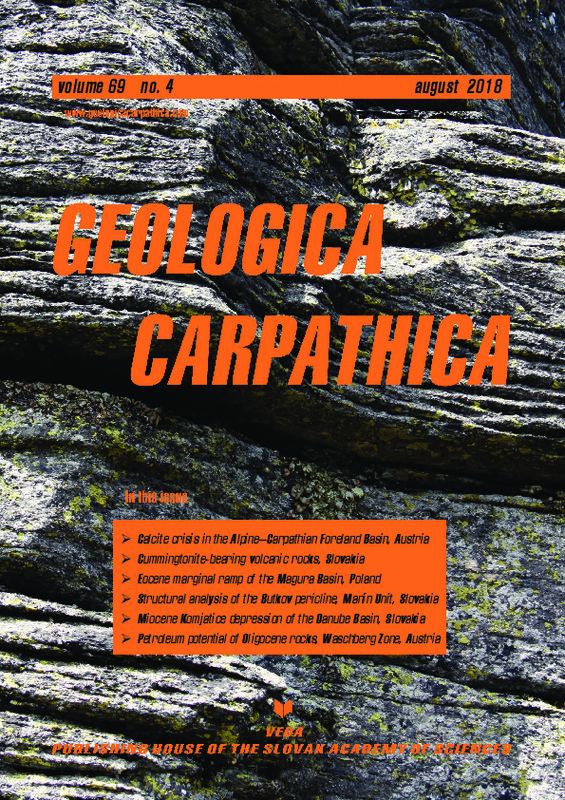 A modern combination of provenance, sedimentology and biostratigraphy together with the reported redefinition of Pannonian formations resulted in a new lithostratigraphy of the study area. Moreover, newly published volcanic rock age data were used for calibration of biostratigraphy. The overall age span of the sedimentary fill is occupied only by late Badenian–Sarmatian (Serravallian) to Pannonian (Tortonian–Messinian) strata: 1) the basal alluvial sediments of the newly defined Zlaté Moravce Formation; 2) late Badenian–Sarmatian (Serravalian) marine sediments of the Vráble-Pozba Fm., connected with tectonic opening of the depression; 3) Pannonian (Tortonian) coarse grained sediments of the Nemčiňany Fm. with an erosional base; 4) Pannonian (Tortonian–Messinian) predominantly fine-grained, basin floor to slope Ivanka Fm., sandy deltaic Beladice Fm. and predominantly muddy, alluvial Volkovce Fm. In the middle Miocene provenance is situated in Paleozoic sequences and Neogene volcanic rocks occurring currently in the NE. During the late Miocene, provenance is changed to the NNW (Tribeč Mts. ), although the transport from the NE also remained. Keywords: Neogene, Danube Basin, biostratigraphy, age calibration by volcanic rock provenance analysis, Zlaté Moravce Fm.